We work towards bringing about a holistic development of the children, who are entrusted to our care. Most children joining school now are likely to enter the work force in 2030 or later. The rapidly changing work and life environment has made the conventional models of school education (relying on rote and impersonal methods of teaching) redundant. 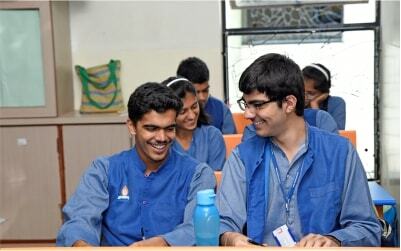 The founder members of Sanskriti School, also eminent educationists started the school with the following core values. To have a personal connect between children, teachers and parents and working like partners to understand the unique needs of all our children. To give children access to world class facilities and a program which will help them develop confidence, courage and creativity and not only rely on mere bookish knowledge. To work hard towards preparing our children for a future where new technologies like Artificial Intelligence, Virtual Reality & more will equip our children with very different skills compared to most conventional schools. To develop good values in our children and so that they become good human beings who are happy, content and responsible members of the society. All of the above is only possible when parents and school work like equal partners with transparency and faith in each other. It is only possible for the child to achieve his/her full potential when both sets of mentors (parents and teachers) are working with respect for each other’s views and efforts. Sanskriti School has been started by eminent educationists and professionals to create a loving and happy environment where the children are at the center of all considerations. Mrs. Devyani Mungali has over 30 years of experience in teaching English in some of the finest educational institutes in the country. Mrs. Devyani Mungali is a trained Bharatnatyam. The tryst with education began with her great grandfather Pt.Hariram Pande,one of the founders of Banaras Hindu University who was also a renowned Sanskrit scholar. Her grandfather was an eminent educationist with the Rajkumar College. Her own father was a world-renowned yogi and philosopher and founder of several institutes world over. Devyani is a trained Bharatnatyam and is well versed with the Warli and Tanjore styles of painting. She has been writing stories for children and has been the recipient of several awards for her work in the field of education. An avid reader and music lover, she firmly believes that unconditional love and patience are the prerequisites for a good educator. Mr Dikshit retired as the Head of the Department of Physics, the Doon School after having taught there for 25 years. He did his Post Graduation in Science Education at Chelsea College, London University in 1979-80, on a Fulbright Scholarship of the British Council., He has been a part of various workshops all over the country and overseas, on topics as diverse as Electronics and Creativity. He also played a leadership role in the UNESCO sponsored conference for Integrated Approach to teaching science at the University of Maryland, USA. Dr. Mungali spent a successful 24 year career in the Indian army where he was a paratrooper and mountaineer and was involved in many leadership roles. He has served as an instructor and trainer for young officers in the Indian Military Academy (Dehradun) as well as the National Defence Academy (Pune). He holds a Doctorate in History and is also a member of the FRGS (Fellow of Royal Geographical Society, London). He is also a passionate sportsperson and has climbed several peaks over 20,000 ft. He was the first Indian to lead a river rafting expedition in the Upper Brahmaputra and currently serves as the Chairman of the Club Committee of the AIFF (All India Football Federation). No two children are alike and our systems and processes are aligned to a personalized educational experience where the unique strengths of each child can be moulded and given full vent by the school. The ability to regulate one’s own emotions and manage successful interactions with other people is key for later academic performance, mental health, and social relationships. Children’s emotional development is built into the architecture of their brains. We believe in a holistic model of education and are strong believers in the methodology and prescriptions of the Center on the Developing Child at Harvard University.